Note: The post, below, was originally published on November 21, 2013. This week I lacked the time, energy, and (sadly) the “juice” to write an original post. So I thought I’d reprise this piece – in which I consider a friend’s question about whether I’ve peeled enough layers with this Jenion blog – as a way of taking stock. How do some people do it? Make you, a complete stranger, feel “seen”? Valued, like you are the most welcome person to enter their presence that day? I had that experience last Saturday, as I strolled through the 12th Annual Book Arts Festival at the Minnesota Center for Book Arts. It was raining outside so, having just arrived, I was dripping wet. I stopped at a table covered in beautifully crafted paper sculptures and handmade books, most in shades of white. I was clearly reluctant to touch anything on that table, but the artist, Regula Russelle, encouraged me to do so anyway. She said, “I believe that book arts are tactile”, touching was practically required. We struck up a brief conversation when she mentioned that she is working on a collaborative show on the theme of “Hospitality” – which is, of course, one of the Mercy values I now carry in my heart. Regula embodied that value, and it touched me more deeply than she realized, I’m sure. As I wrote last week, I feel bare lately. Every perception lands as if on sensitized skin, every emotion burrows beneath the surface at first breath. As I lingered at Regula’s table admiring her work (but also just wanting to stay close to her warmth a little longer), I picked up a small hand- printed and -bound volume of poetry. It fell open almost eagerly to the poem above. The poem, the ambience, Regula’s hospitality, brought tears to my eyes. As you know, the name of this blog is Jenion, the tag-line: Peeling Away The Layers. Last week, my friend Layne, in her inimitable style, asked me, “Are you still peeling away the layers, Jenion? I kinda think we got to the middle a while back.” Well. There’s a long answer to that question and a short answer – and I have been pondering them both since Thursday. The short answer is “You’re right, we got there a while back”. The original purpose of Jenion was to peel away the layers of denial and shame, in fact, all the layers of muck associated with my disordered thinking and emotions about food and weight. And I believe we have worked through these things together, as so many of you supported my walk through that difficult and emotional labyrinth (some even joined me). I may never be completely content with the number on my scale, but I can, without reservation, claim to be in a sound emotional place regarding my relationship with food and a healthy life. As for the long answer, I refer to the poem by Naomi Shahib Nye. I can relate to the poem on the surface level, as can anyone who cooks (especially health-conscious food). Onions are in nearly every dish I make – sautéed greens, omelets, casseroles, soups. I work very few recipes that don’t begin with “one medium onion” (chopped, finely diced, or sliced). As an ingredient, I have come to know the onion intimately. Its very omnipresence causes us to overlook its importance to our palates, to the fullness of flavor of much of the food on our table. That is so often how we relate to the layers of our selves, as well. We see ourselves as ordinary, and we seem so obvious to ourselves that we sometimes forget to look below the surface. The tough papery layer of our skin remains intact even when peeling it off, when revealing parts closer to our hearts, would be in the best interest of self and/or others. In the beginning, Jenion was the just a clever (at least I thought so) name for my blog. Over time, though, it has become my pseudonym, my alter-ego, and that part of me that remembers there are layers upon layers beneath the seemingly standard surface of my days and activities. And it is the part of me that honors the layered-ness in others as well. Am I still peeling the layers? It is in the nature of the onion. Considering Layne’s question has brought about intense focus on the image of the onion. 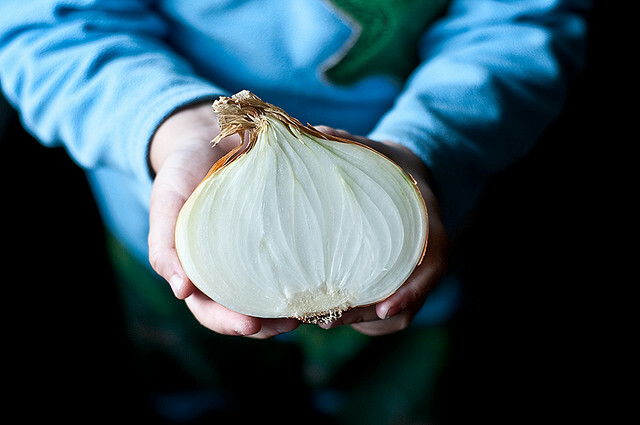 Almost tangentially it has occurred to me that an onion (in addition to being a metaphor for soul-searching) may be a perfect symbol of hospitality. It offers itself to us, layer by layer. It flavors our meals, it accepts our tears, it nourishes us – and asks nothing in return. The poet says, “For the sake of others, disappear.” Hospitality may not require disappearance, exactly, but it does require that one place the “flavors” (needs, presence) of others in the central, starring role. What a gift that is to give another soul – and what a joy to receive. Last week a friend brought me a bouquet of flowers. There were several roses, some mini carnations, three pink tulips and some baby’s breath in the bunch. I brought the flowers home and put them in a vase on my dining room window sill. The next day, admiring the lovely display, I noticed that it looked a little different than when I had first put the arrangement in water. Was it my imagination, or were the tulips growing? I decided it was a trick of the eye – cut flowers don’t grow. Over the next several days, though, I watched as the tulips steadily inched their way higher in the bouquet than the other flowers. Now, as the entire bouquet is wilting, those three pink tulips stand approximately 5 inches taller than the rest. Their slim stems delicately arch toward the window, the blossoms seeming to peer longingly at the street scene outside. Turns out, unlike other cut flowers, tulips do, in fact, continue to grow after they’ve been cut! I found several online sources that say so, and though I’m still unclear as to the biological mechanism by which this happens, I find the fact of it amazing! I look with astonishment at the tulips. I now know they not only grew, but the stems’ delicate yet decisive curve is because they are phototropic: tulips bend toward the light. In his long poem, “The Wasteland”*, poet T.S. Eliot observes that April is the cruelest month. The wasteland he describes is the spiritual desert of modern life. This April feels particularly cruel to me – in part for the very reasons Eliot describes in his poem, exacerbated by our world’s political climate. But also this year, I am watching dear friends grappling with illness, loss, and grief. And I am deeply aware of the small windswept desert in which my own spirit is walking. In the midst of this difficult April, I couldn’t help but think as I googled information on my extraordinary tulips, that these three pink blossoms are a perfect and lovely illustration of hope. When we feel we’ve been cut – no longer rooted in the soil at our feet, hearts disconnected from the people and things that usually feed us, fear or grief overwhelming our energy reserves – it is easy to feel that life has deserted us. The tulips on my windowsill tell us otherwise: growth, new life, potential remain within us despite all expectations to the contrary! Growth will happen, unexpectedly, perhaps miraculously. It is also true that deep in our hearts we carry the urge, the inborn desire, to bend toward the light. We will do it without consciously knowing, just as the tulips do. In that bending, we will eventually find nourishment – in the warm hug of a friend, in a peaceful moment of silence, in the promise of a soft spring rain. When I was in graduate school, like so many students then and now, I was poor. So when my lower right wisdom tooth became impacted, without dental insurance I had little choice but to go the the college of dentistry where I could get low-cost care from supervised dental students. X-rays were taken, and I was given two options for treatment: pull the offending tooth now as an outpatient procedure, or schedule in-patient surgery and have all four wisdom teeth removed at once. Of course, the second option, while the preferred one presented by the supervising doctor (not a student), necessitated cutting the other three wisdom teeth from the bones as none of them had shown signs of descending into the gums. Faced with the choice of ending my current pain swiftly and immediately, or fixing the problem by experiencing exponentially more pain at an astronomically higher cost, the choice seemed clear. I chose the “easy option”, and the supervising doctor shrugged his shoulders and signed off on it. Laughing gas was administered and two dental students (my dentist and another called to assist him) reassuringly told me it would soon be over. What the x-rays hadn’t shown was that the roots of the tooth had hooked backwards, and as they pulled the roots were actually digging in deeper, like a fishhook. When the carnage was finished, I was sent to the waiting room. Dazed and unsteady, I sat patiently waiting for “clearance” to leave – I had no one to drive me home and more nitrous oxide than typical had been administered. At closing time, the receptionist told me I needed to go to the check out window. Once there, I paid my 20% cash down and was told that, if I experienced any pain, I could take ibuprofen. I didn’t feel at all well, having just been through what I could only describe as a horrifically barbaric experience. I drove, unsteadily, to my brother’s apartment, praying that he would be home. When he answered the door, he cried out, “Oh my God, what happened to you?”, grabbing me and pulling me quickly into his living room. He swiftly locked the door behind me, before ushering me to a seat. When I tearfully told him about the traumatic experience I had just been through, he sat back, visibly relieved. “Thank God!,” he exclaimed. “I thought you had been mugged or something! !”, which explained the swiftness with which he had locked the door behind me. We went down the hall to his bathroom, so I could see myself in the mirror. My face was swollen, bruised, and covered in dried blood and saliva. I was astounded, and angry. Not one person at the dental college had blinked an eye at my appearance, nor had anyone suggested that I should stop in the restroom and wipe the blood off my face before leaving. My brother drove me home, made sure I was able to safely clean up and get into bed, then went to the grocery store. He came back with soft foods that were on the list I’d carried home from the dental college. And ice cream – he brought me plenty of ice cream. Throughout that horrible day, I was vulnerable. First, because I was in pain I was vulnerable to suggestion. I knew that the supervising doctor had more experience and made his recommendation for surgery based on his superior knowledge and experience. But the dental student offered me an easier and less painful option. I took it, although in retrospect, both the student and I regretted that choice. After the tooth was pulled and while under the influence of the anesthesia, my grogginess and growing pain made me vulnerable. I docilely followed the terse instructions I was given, assuming that those staffing the clinic had my best interest among their concerns. It never occurred to me that they would just leave me sitting there, unattended and unwashed. Or that they would send me home with insufficient medication for the trauma I had just experienced. Or that they would allow me to drive myself home, if it were unsafe to do so in my state of dazed confusion. When I knocked on my brother’s door, I was a vulnerable mess. I was in serious pain, I was exhausted, and I was already feeling that I had made bad choices. I was fairly certain I was, at that moment, incapable of taking care of myself. All that day, I interacted with people who ought to have been both aware of and compassionate toward my state of vulnerability. People who by virtue of their roles might have been expected to be concerned about my well-being – or at least worried enough about their own professional liability to see to my safety. Of all the people I had a reasonable expectation of care from that day, the only one who responded with concern and trustworthiness was my beloved brother. I’ve been thinking about this long ago day quite a bit the past few weeks. It sticks out in my life experience because, in general, the people I interact with, whom I expect to be trustworthy by virtue of their roles or jobs, actually do behave in a trustworthy manner. However, every evening’s news contains at least one story or reminder that this isn’t always the case. And for those in my community who don’t look like me, the possibility is greater that they will experience disinterest or even cruelty when compassion might reasonably be expected. Brene Brown has said, “Compassion is not a virtue — it is a commitment. It’s not something we have or don’t have — it’s something we choose to practice.” I’d like to think that compassion is a commitment and a practice that I choose regularly – and not only toward those I already love. I like to think that I am especially compassionate toward those who are experiencing unsought-for vulnerabilities. But I wonder: how often have I just wanted the girl with the swollen face to go home already? How often have I purposely given the impression that my busyness trumped someone else’s need? How often have I done the barest minimum for the vulnerable person standing in front of me? I want to be the kind of person who tucks someone into bed, then runs out to get them ice cream.